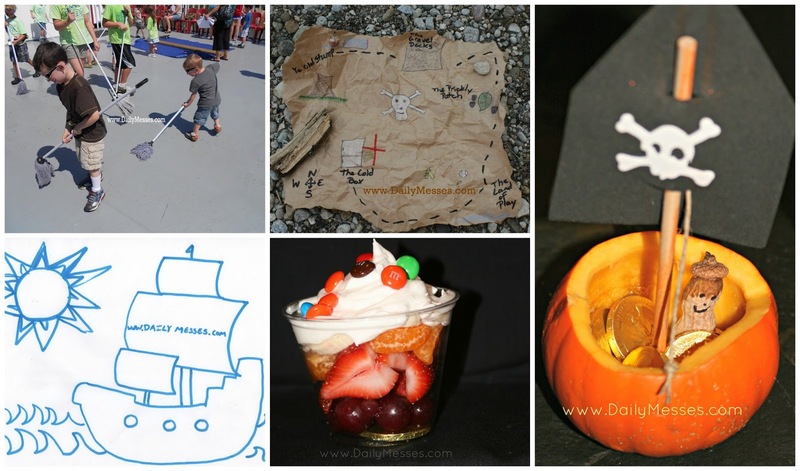 Daily Messes: It's International Talk Like A Pirate Day! The time has once again come for us to don our pirate hats and seek out treasure, for today we are pirates! Arg! Arg, Maties. I made treasure maps and sent the boys on a treasure hunt. Afterwards we colored a pirate page (included in the post), made pumpkin pirate boats, ate buried treasure cups, and watched Scooby Doo: Pirates Ahoy!. Arg, Riverboat Pirates. Last summer we went on a pirate themed riverboat cruise. You can always make the kitchen the deck of the boat and give them mops to swab the deck. For another idea, hide plastic or chocolate gold coins around the yard or house. What's your favorite way to celebrate Talk Like A Pirate Day?